Today’s post is a guest post by Julie Winkle Giulioni, coauthor of "Help Them Grow or Watch Them Go: Career Conversations Employees Want" and principal and instructional designer at DesignArounds. This piece originally appeared in Advanced Resources HR Insights Magazine. Few things frustrate leaders more than seeing top performers take their talent down the highway to a competitor (or even down the hallway to another department). As a result, employee engagement efforts abound. Many organizations work diligently to cultivate environments that enhance job satisfaction, help people find meaning in their work, recognize and reward employees for their contributions, and support personal and career development. 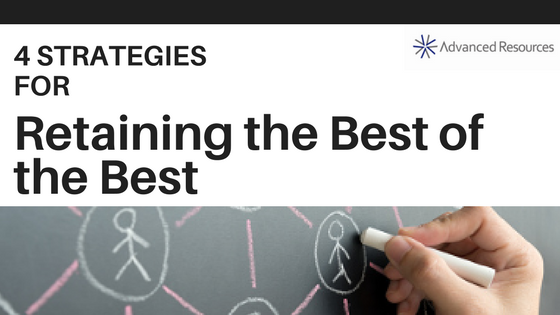 Although all of these strategies are good for business and can contribute significantly to improved retention, leaders cannot depend upon these efforts alone. It’s tempting to load up a key, high-impact employee with a body of work that allows him or her to become the “go-to person” in a particular area. But what happens when that employee is gone? Distribute the risk—and increase the brainpower—through strategic delegation. Carve up and disperse work and assignments in a way that won’t put all of a department’s (or organization’s) eggs in one basket. Career development is a well-known and well-documented retention strategy. But it’s also an attrition-recovery strategy: by helping each employee grow to his or her potential, the organization creates a full pipeline of internal resources ready to continue essential work. It also develops a positive brand in the talent marketplace, making it easier to attract top talent and backfill key roles. Most organizations are operating leaner than ever before and must deploy resources with surgical efficiency. But creating the reserves required to weather unwanted turnover means thinking in terms of strategic redundancies. Build backups and actively encourage employees to share tasks and projects. This strategy offers protection from resignations and allows the organization to absorb the effects of unexpected absences. It also encourages a generous approach to vacation leaves (and the productivity boosts associated with rest and rejuvenation), because everyone knows that important work will continue to get done. The departure of an employee affects the business. But it has interpersonal implications, too, and can strongly affect his or her colleagues. As a result, organizations must find ways to engage employees, to build resilience, and to cultivate the ability to adjust quickly to inevitable workforce changes. They must take a realistic and clear-eyed view of the future to confront the inconvenient truth that they will, at some point, lose key talent. Looking for more valuable resources to help engage and retain your talent? Click to download your free guide to Building Employee Engagement: Three Elements to Include in Your Employee Engagement Strategy. Julie Winkle Giulioni has spent the past 25 years working with organizations worldwide to improve performance through learning. She is the coauthor of Help Them Grow or Watch Them Go: Career Conversations Employees Want and principal and instructional designer at DesignArounds. She can be reached at julie@juliewinklegiulioni.com.